Mountain Colors Hand Painted Yarns: Bearfoot Now in Pastels!! We ARE listening!! After a large number of requests and much discussion about dyeing techniques we have decided to offer our Bearfoot yarn in ALL of our colorways, including pastels. In the past we did not offer this yarn in the lighter colors as there is a marbled/frosted effect with lighter colors. Knitters have told us they don't mind these lighter highlights so....effective immediately these yarns are available. Keep in mind that our Bearfoot yarn takes the color a bit darker than any of the other yarns we have so our pastel Bearfoot is lighter than our other colors but it is not extremely pale!! It may take your local shops awhile to get the colors in stock so if you contact your shop for a Special Order don't forget to mention you read this NEW information in our blog!! We don't mind Special orders and we can fill your special order quickly!! We can then send the yarn to your local shop or drop ship it to you if the store isn't nearby. 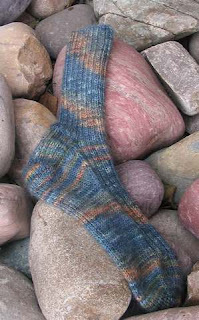 The lady who knit the socks in the photo above said these were the "most beautiful socks" she has ever knit!! Wow. That was sure nice to hear! We hope you will love this yarn as much as she did! Hooray! I've already placed my order with my LYS. Sheri should be talking with y'all at TNNA, and I'm looking forward to the new colors in my FAVORITE sock yarn!